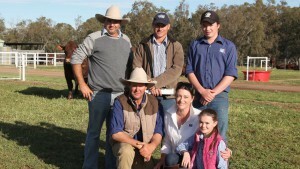 Celebrating their 21st sale in record style were Yamburgan principals, John and Liz Manchee, Narrabri in August. The sale result caps off a stellar year for the prefix, coming on the back of taking out the Champion Carcase at the ANZ National Beef Carcase Competition during Beef 2015. To celebrate and mark the auspicious occasion the principals staged a dinner for 120 guests on the evening prior to the sale. The evening’s entertainment was provided by Murray Hartin and presenters included Richard Norton, Managing Director, MLA and Craig Price, General Manager, Livestock, Kilcoy Pastoral Company. The next day and immediately before the commencement of the sale, Duane Woodham announced the launch of the JBS Shorthorn branded program and Life Membership was bestowed upon founder of the Yamburgan prefix, Lionel Manchee by Society president, Jason Catts. In all 85 bulls sold to a top of $28,000 on the way to posting an event record average of $8882 to end in a total clearance at auction. 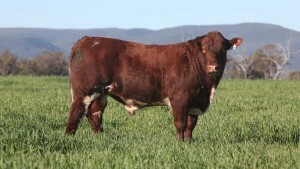 The Manchee buyer delivery list included four mainland states and Tasmania in a sale where yearling bulls hit a high of $26,000 and 86pc of the sale product went to repeat clientele. In a dissection of the offering 69 two-year-old bulls averaged $8717 while 16 yearling counterparts set a $9594 medium and 15 heifers topped $8000 on two occasions to set a $6529 average. The entire male section of the catalogue were forage oat prepared with the heifer portion prepared on natural pasture. The operations two-year-old males averaged 23 months, with an average liveweight of 831kg, an average daily gain of 1.16kg/day, an average EMA measurement of 121 sq cm, an average fat depth scan of 14/9mm, an IMF reading of 6.3 and an average scrotal measurement of 39.5 cms. In comparison the yearling bull averaged 17- months in age with an average liveweight of 683kg, a daily gain of 1.30kg/day, an EMA average of 105 sq cm, and fat depth scans of 10/7mm with an IMF reading of 5.8 and an average scrotal circumference of 39cms. Sale topper at $28,000 was Yamburgan Emperor J396 (P) (Yamburgan Emperor E103) selling to commercial producer, Malcolm Smith, Picton, NSW. From a daughter of Yamburgan Roxborough 10th (Yamburgan Adela B243), Emperor at 23-months, weighed 926 kgs boasted an EMA measurement of 128 cm sq, fat depth scan of 17/10mm and an IMF reading of 6. The bull ranked in the top one pc for scrotal size, domestic and northern maternal indices along with a top five pc ranking for gestation length, 600 day growth, milk rib and rump and export maternal values and a top 15 pc ranking for 400 day weight, carcase weight, EMA and IMF values. Top of the yearling section of the offering was the roan, $26,000 Yamburgan Zeus K62 (P). The 17-month-old Yamburgan Zeus H140 (P) son was a heifer’s first calf. Weighing 642kg he delivered a top one pc ranking in the breed for gestation length, rib, rump, domestic and northern maternal indexes and a top 5pc ranking for export maternal and a top 10pc index for birth weight, scrotal size, EMA and IMF. His raw data included a fat depth scan of 17/9mm, 6.3 IMF, 102 EMA and a daily gain of 1.25kg/day. Zeus H140 will take up duties for the David White’s, Butterleaf, Stud, Glenn Innes. Three sons of Zeus H140 in the sale averaged $18,333. Also at $26,000 was Yamburgan Emperor J194 (24-months) (952kg) (129 EMA) (23/156mm) (IMF 6.6) going to repeat buyers, Don and Bruce Eather, Doolibah, Bunnan. Another yearling to feature was the $20,000 Yamburgan Zeus K25 (18-months) (700kg) (IMF 6) selling to Roger and Naomi Evans, Nagol Stud, Tamworth. A $16,000 price tag accompanied the 18-month-old Yamburgan Monkira K11 going to Sam Ingles, Ingleside, Crystal Brook, SA. Volume support for the fixture came from repeat client, Stuart and John Brownlie, Deepwater, Meandarra, who took eight bulls for an average of $12,125, topping at $15,000 twice. Warren Coventry, Lynoch, Armidale signed off on four to average $9250 to top at $12,000. There was a huge array of buyers that ended with three bulls each. These included Bob Simpson, Milawa, SA; Scott Counsell, South Delta, Barcaldine; Anthony and Mara Grills, Waverley, Guyra; Richard Woods, Boori, Boggabilla; Colin Hall, Coobuns, Condobolin, along with Bruce White and Carolyn Campbell, Tuck Tucka, Boggabilla. 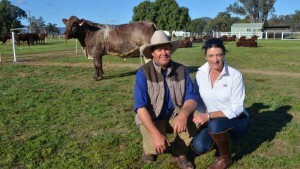 A 23-month-old son of Neearra Governor, Yamburgan Major J420 made $18,000 selling to David and Julia Hardy, Buckaringa, Merriwa while long term client, Bruce Weir. Rosedale, Cowra returned taking the $17,000 Monkira J248 (24-months) (Yamburgan Tobermorey F90) (968kg) (132EMA) (IMF 7.4) Taking an active participation in their selections at the sale were the female students of the Calrossy Anglican School, Tamworth. The school outlaid $11,000 for a roan 23-month-old son of Emperor E103 and a heifer (17-months) for $6500 sired by Waukaru Orion (P) (ET) (IMP USA). Another sale feature was the offering of the entire drop of autumn 2014 drop heifers with the exception of those not retained. This was the first time since 1984 that females had been offered and these heifers were sold on a ‘Buyers Choice’ system (the buyer could chose either one or both heifers at the fall of the hammer). Two heifers sold for $8000 sums. Belinda Emery and Mark Ross, Emross Stud, Delungra paid that amount for the 17-month, Yamburgan Cloudy K55 (Emperor E103) while the same figure procured the same aged Yamburgan Countess K35 also by Emperor E103 going to Gordon Bebb, Darling Plain, Delungra. 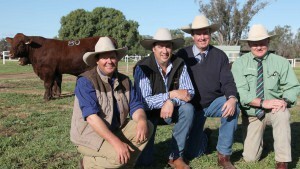 Gordon Bebb secured four heifers to average him $7125. Repeat clients, Andrew and Lucinda Chick, Mia Mia Stud, Gurley, purchased two heifer daughters of Yamburgan Tobermorey F90 (AI) (P) for an average of $5750. New investors, Tasmanian breeders, Reg and Rebecca Woodiwiss, Royston Stud, Sunnyside took with them a pair of Waukaru Orion (P) (ET) (IMP USA) daughters to average them $6000. Agents: Hamilton Mortimer Agency and Landmark. Pictured (L to R): John Manchee, Roger Evans, Paul Dooley & John Settree with the $20,000 sire purchased by Nagol Park Shorthorns. Pictured (l to r): Stuart Brownlie, Deepwater Farming, Craig Price, Kilcoy Pastoral Co with Nick, John, Liz and Sophia Manchee. Pictured (l to r): John and Liz Manchee. Pictured: Lot 2, sold for $14,000 to Deepwater Farming.